The day yesterday before,It was my husband's birthday. These days,he has been so busy that he can have dinnier only once or twice a month in our house . Do you think I tell you a joke? No,I'm serious! So,I wanted to cook his favorite foods on his birthday, and decided to learn "the French gorgeous cake " from patissier M! 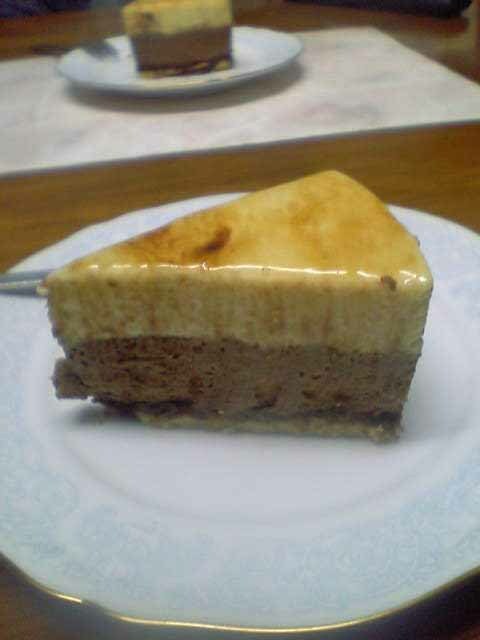 The cake which I learned is "Bavarois aux trois chocolats" ,which means "Triple chocolate bavarois"
You know,it must be gorgeus,mustn't it? In her kitchen, special tools were fully equipped . I was impressed there were five or six even rubber spatulas ! As for her, she works now in a very popular bakery shop in our hometown. As she is going to marry soon and move to the city where was dozens of kilos distant, I think that will be really a waste if she, keeping such a special skill doesn't teach someone how to make cakes. M showed me a recipe of handwriting and explained me a procedure, and prepared quickly those materials on table. 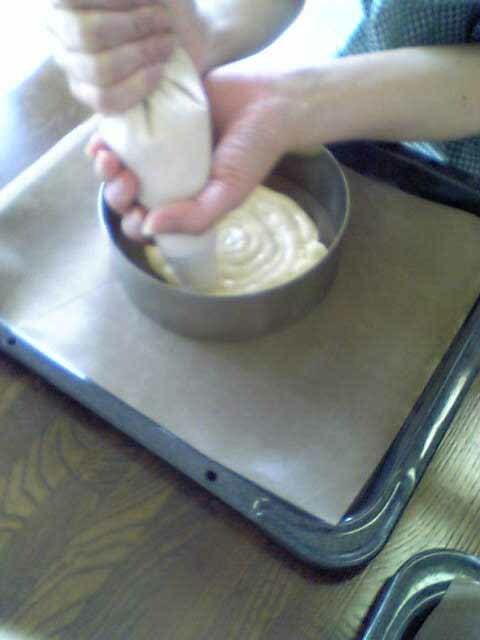 Making biscuit which was supported to be put as bottom. Eggs and sugar, flour. . . The leftover of this biscuit changed itself into my and her " snack" while we made this cake. 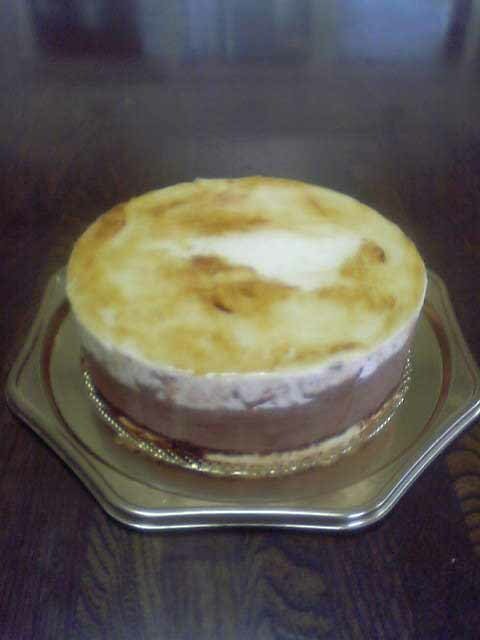 It was also very delicious with mousse, with jam, with Japanese bean jam. . . .
Oh! 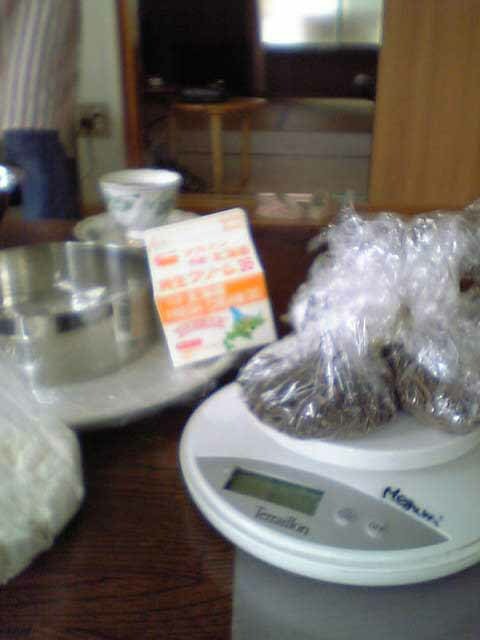 I can get weight easily! Wringing out a bag full of this dough. She told me there was a failure pattern that an amateur did. Though I never noticed it till M pointed it out, an amateur like me puts both hands together. I could wring out it neatly uniformly when I changed position of my left hand according to her advice. . . . It is ... mmm. We can make a beautiful cake if we change position of our hands such a little ! 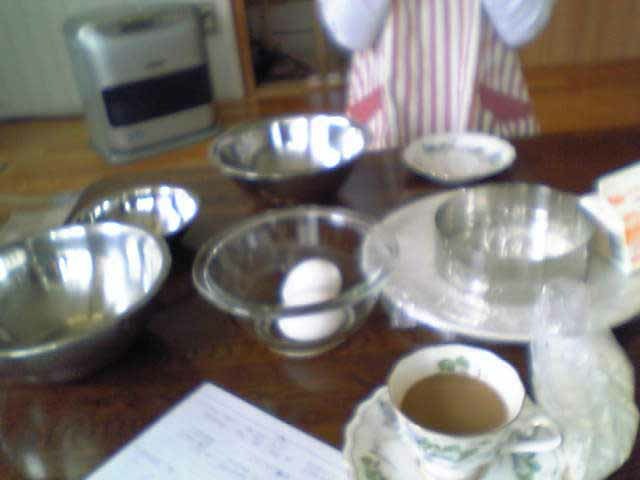 From this time, I considerably concentrated on the making of bavarois dough and I completely forgot to take pictures. I made "anglaise source" for a base of bavarois. The sweet sauce seems to be like custard source and seems to be more rich than it. 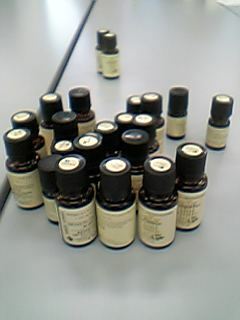 M taught me a keyword when we made this source! ! ! ! "Un Nappe"! 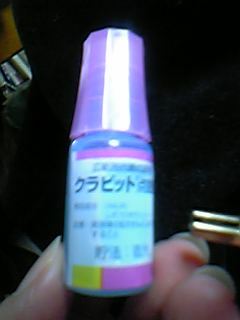 ←this is French. She told me that it was "a moderate thick condition expected". 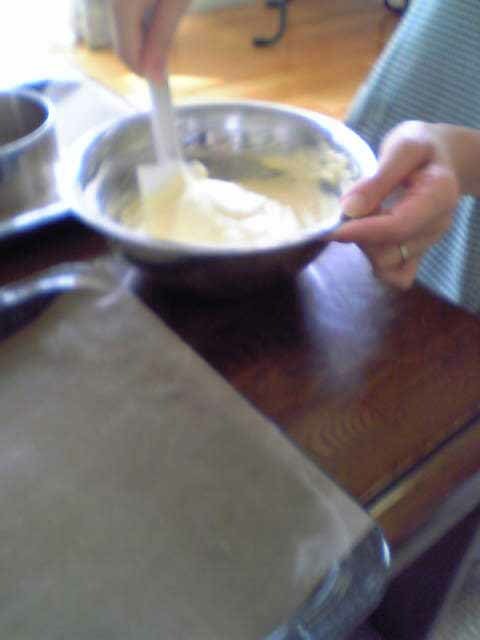 M traced the source which stuck to a spatula with her finger, and checked its "Un Nappe". But ,Mr Tore tore , Please teach us correct French"Un Nappe" because we didn't understand even if how to spell ! 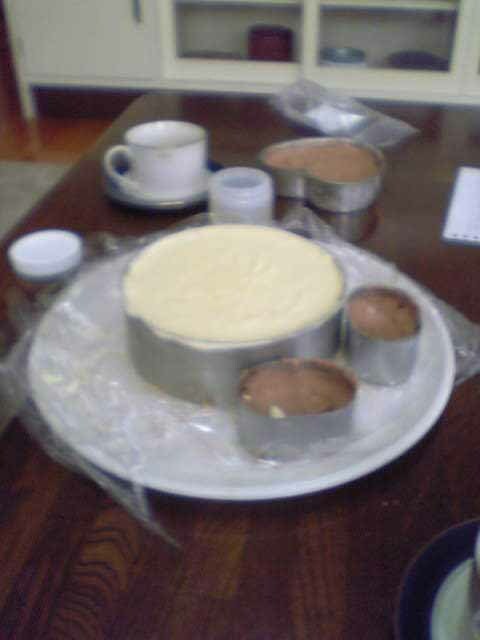 We made three types of bavarois,bitter chocolate, milk chocolate and white chocolate with anglaise source made "Un Nappe". . . and put into a refrigerator　one after another. As we made biscuit dough and bavarois a lot ,we could make extra three mini-cakes with these. We put "glaze" on the cake as finishing. Please imagine "glaze" is like starch syrup. And make coffee syrup and spread it to make patterns on the glaze with a putty knife. It needed "my sense of beauty" . M was "the left side of the stage"
She said to me " Oh! good job! well done!" She really made me feel good,and I could decorated the cake pleasantly. speaking frankly, both a first look and taste are the all best in the cake which I made throughout my life! ! ! M, you are really terrific! You are the first-class patissier, as well as the first-class teacher! You are "Sadaharu Oh" in patissier ! ! My husband and I ate this cake together in the evening. Among whole of this, he ate 1/4! After all, I really felt that making delicious foods for someone can them happy. I guess M had better have a private school! My husband's birthday is at the end of this month. He is a super person having a sweet tooth as he eat one bag of peanut chocolate in one night! And I planed a certain surprise happening to make him happy on his birthday in this year! ! ! I make up my mind to make "a gorgeous birthday cake" learn from a professional patissier. A teacher is Ms M who is my friend in English conversation class. Ms M has a terrific career. She quit her job as a company emproyee and went to Canada several years ago, and trained herself at "LE CORDON BLEU" in Canada . Finally,she became a great patissier ! 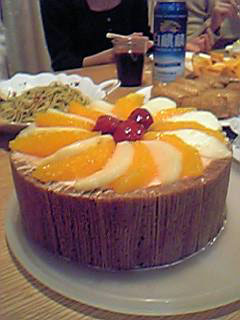 This is the cake which Ms M made easily for a pot luck party with English class friends. Speaking frankly, I guessed this was much more delicious than cakes sold in the neighborhood confectionerys! Of course,it was pretty good. When I visited her house before, she showed me her notebook and doctrine. I could see only memo full of Japanese in the page which she wrote in beginning days ,but I could see gradually memo written by English and French for the end of her studying abroad. Even if I can understand Engilish,I can never understand French ! 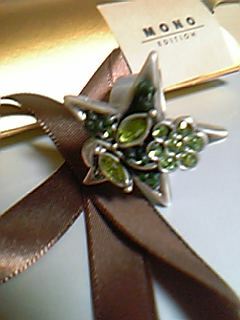 Many photographs of the work which made by a teacher as a sample were on file as well as works made by Ms M in the . Those were beautiful works that a amateur can hardly make. 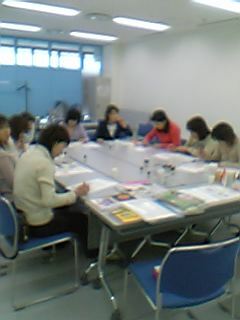 Ms M told me "A teacher who does interesting lectures always be poor at a work"
As for the work of the teacher whom M said "he is poor at work" ,it seemed to be the work which does not have a fragment of sensitivity. and it couldn't be the one the French had surely made,too. As for the recipe of the teacher, a work made by M was more beautiful than the one made by the teacher. Sure enough, the making of cake is the art surely. I requested her "I wanted you to teach the making of cake" before. My first request is "pudding" (a mystery), but Ms M did such a suggestion. "I guess you can make easily pudding. How about the elaborate cake which you can make hard alone?" My husbad must be pleased surely on his birthday if I make such a cake like a splendid work of art! That's why I'm looking forward to learn "a work of art" in M's house on the day of his birthday . I wonder whether I can make it perfectly or not. . . . ? ? ? 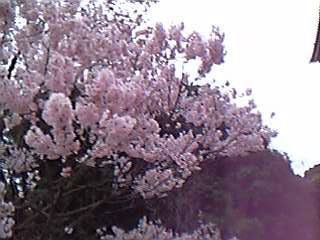 I went to drink with Y after seeing cherry blossoms. She took me her favorite Japanese restraunt which is well-known for fresh seafood dishes and horsemeat dishes and premium　Sake. She recommended me some kind of premium　Sake, and we had some dishes to go with Sake. 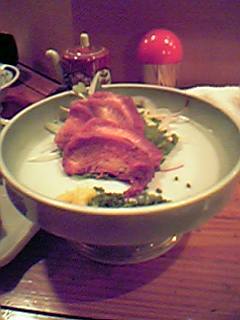 The most impressive one was "Sashimi of horse's tongue"!!! Have you ever eaten it ? It was the first experience for me　! I can't say Sashimi of beef can be superior ! Any way, it's beyond description ! I haven't ever eaten such a fantastic dish ! She treated me as birthday celebration on this day. I thought myself to be lucky utterly. Thank you for the wonderful night. I met Mrs.S for first time when I was a university student. We worked together as MC at KARAOKE restaurant in Ikebukuro. These days, we can never see such type of restaurant,but there were rarely "KARAOKE BOX" in those days. And there was a bar close to the KARAOKE restaurant . 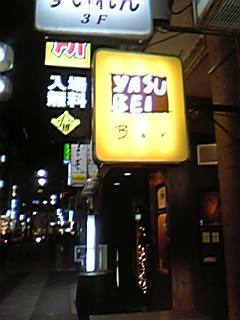 The bar's name is "YASUBEI" and we used to drop by there. 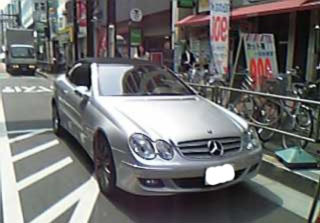 It located at nearby Ikebukuro Station. I remembered that we used to drink bourbon whiskey. It was very popular in those days. Mrs.S asked our ex-colleagues to come and celebrate my birthday. And we enjoyed dinner together in east area of Ikebukuro. Mrs.S and I decided to go another bar after dinner. Mrs.S: "Do you know whether "YASUBEI" is still open or closed?" Me:"Wow! I think "YASUBEI" must had discontinued their business ! If there is still it , we must be surprised!" We saw the sign of "YASUBEI"! Some states of the entrance were different compareing it in those days, but inside interior has not changed at all whether I skidded in time. 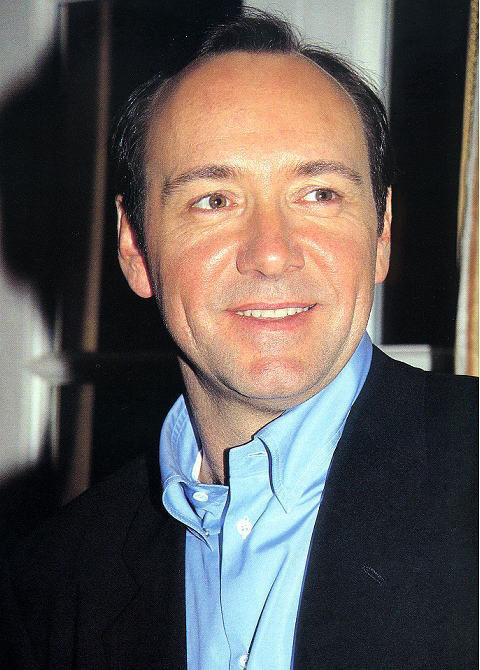 And the master with a good smile remembered our face although we hadn't met more than ten years. "You were MC girls at the ○○restaurant ,weren't you?" So,amazing! I couldn't believe it! First , Mrs.S and I ordered on the rocks of "Four Roses" without question. Was bourbon such a taste ? Was I stimulated by wasabi taste cracker ? I was about to have tears in my eyes. We enjoyed good old topics in those days with the master. "The economy in those days was really in good shape wasn't it? In long time of 18 years, the major restaurant chain that we worked at has disappeared and we can see their restaurant rarely now. I show respect for the master who have gotten over such severe times and developed the bar more from those days . Both McCarran and Hennessy were very delicious. 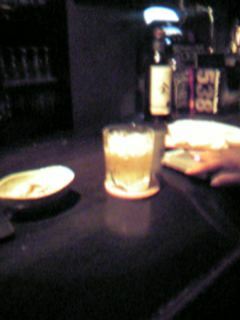 I'll drop by "YASUBEI" to enjoy drinking and nice conversation again. In addition, I was completely entertained until the middle of the night by Mrs.S.